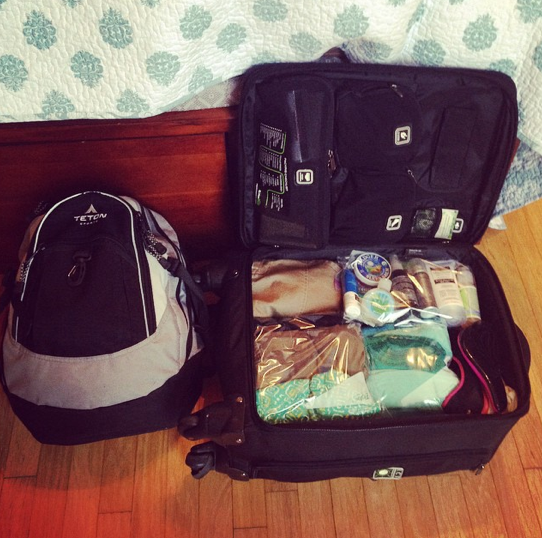 It was finally time to pack for my trip to South Africa last night! Packing for long trips is always a tug-o-war between my inner Boy Scout packing tendencies (you know, the “always be prepared” motto) and my minimalist personality. I was excited that I managed to get everything into a backpack and my carry-on luggage with some room to spare! On the one hand, it doesn’t look like much for a 7-day international trip. On the other hand, I feel like I “over-packed” and prepared for multiple possibilities. I brought a few extra outfits, I brought extra medicine, I brought extra snacks, I brought multiples of things like tissue packs and hand sanitizer. Our secret to traveling often with younger kids is to in an organized fashion. My kids all have their own system — some more detailed than others — and they have it down to almost a science. They packed for the 10-day trip to DC in less than an hour last night! All we had to do was double check their work and pack ourselves. When I had 3 kids under 6 I could have never imagined the day that my kids would be doing all of their own packing — and doing a great job of it. Moms of littles: your hard work and all that time you spend teaching and training your kids does pay off!! Since I’m flying to South Africa on Wednesday and won’t be back in the states until next Tuesday (the 20th), I’m not going to set my usual list of goals for this week or next week. My goals, instead, are to soak in everything from the trip, learn all I can learn from those we’ll be with in South Africa, and let the lessons impact me and sink in deep. 1. Start our Morning Time routine. Read aloud for at least 20 minutes every day. 3. Help the kids write thank you notes for Christmas gifts. 4. Write notes to the children we sponsor through Compassion. 8. Clean out our bathroom closet. 9. Try a new DIY project & recipe: & . 10. Finish writing 3 articles for . I’ve been told that we will have limited access to internet while we’re in South Africa. I’ve pre-scheduled some great guest posts to run here and I’m hoping to be able to share at least a few great deals every day write a few blog posts while I’m gone sharing pictures and telling you about what I’m experiencing. However, I’m expecting that I’ll be offline much of the time. So if things are a little quiet here on the blog for the next week and a half, you’ll know why. I know we’re only just beginning the new year, but we’re going to take a two-week hiatus from all of our 2015 weekly features. I promise we will pick those back up again starting January 26, 2015. I will be when I’m able to get a wi-fi connection during the day, so if you’re not following me on Instagram yet, you can . That will be the best way to keep up-to-date with the South Africa trip. In addition, follow and who will both be traveling with me. Looking for more? Read more posts about #LoveSouthAfrica. Enjoy your trip! We can’t WAIT to hear all about it and your family’s DC adventures, when you return! Blessings and safe travel! It’s going to be amazing! I totally want to know how you teach your kids to pack their own stuff. … And what ages? We started this past year: we had them do it with us a few times and we taught them how to pack in outfits and put each complete outfit per day into one bag. Then we had them do it with some help, and then completely by themselves the last few trips. We’ve just checked and given them a few pointers. We also give them parameters for their packing for each trip — as in, this time, we told them it was going to be quite cold and they needed to pack extra layers and gloves, hats, etc. My mom had a trick for me as a child; she would have me pack like I dressed my dolls. Each doll could wear 1-2 pairs of pants with several tops, one skirt, two blouses, 1 jacket for all looks, etc. So, when I went on a trip, she would have me go to my closet and pack a bag for my doll, and for myself; she would remind me to remember underthings, etc. but after a few trips I was a pro. Jen, it’s just like teaching them anything else. You start by showing them how, then let them do it while you oversee and assist as needed, and after a while they can do it themselves. Enjoy your trip! I went to South Africa in 2000 on a mission trip and loved it! Good luck on your flight. I have flown internationally pregnant and with kids while we were stationed overseas so I don’t have to much advice on flying solo except for good books and hopefully decent movies. You get some kind of award for flying internationally while pregnant and with kids! It’s a great way to keep the kiddos interested in all they are seeing – and they get a really neat Park Ranger badge (each unique to the National Park) when they finish the questions. Sounds like a fun trip for both you and your husband and kids. Their self-sufficient packing really does give me hope for the future. Although my husband and I are personally light packers, packing for trips usually feels like planning for the D-Day invasions around here. We have three kids two and under, with #4 on the way, so there’s always a dizzying array of necessary extras like numerous clothing changes (two of our kids have had reflux), car seats, specialty formula for our micro-preemie, and, sometimes, pack n’ plays. As each outgrows diapers, learns to sleep in a normal bed and eat in a normal chair, and starts to spill food or spit up a bit less I really look forward to the list shrinking dramatically! Your kids show that the light at the end of the tunnel is not that far off! I could have never envisioned how independent and helpful they’d end up being when it felt like we were doing everything for them, but there is light at the end of the tunnel. It takes a lot of work and effort to get there, but it’s so very worth it!! Godspeed and traveling mercies! What a great opportunity! I will pray for your time there! Soak it all in. Your goal is to get to Africa…a fantastic goal! Can’t wait to hear more. I think it’s so neat that your children can pack for themselves and after reading the comments I love how you taught them. You will be making it back to your family safe and sound. Many prayers will be going with you including mine. Have a great trip. Your kids will have a great time in D.C. There are so many fun, frugal activities to do there. I highly recommend the Air and Space Annex. It’s in Chantilly, VA but it is worth the drive. Thanks so much for recommending that! Enjoy the challenge of visiting Africa! I’m curious to know what travel pillow you chose and how well you like it. We live in South America and fly enough to make it worth investing in a good one! Blessings to you as you go, and your family as you are away! Can’t wait to hear your reports! Crystal, Have a safe and wonderful trip! I can’t wait to follow along on Instagram:) I also love that your children packed for themselves! I bet they will have a great time in DC too! God’s Blessings to you and on this life changing trip to South Africa! May God be with Jesse and the kids on their adventure too. I’ve been wanting to request another minimalist wardrobe vlog. How does that work with mentioning the need to buy summer clothes? Do you just keep clothes for the current season? I realized that I didn’t have 5-6 outfits that would work for really, really hot weather, lots of walking, getting dusty and dirty, so I went ahead and added a few things to my current summer wardrobe so that I’d have enough things for this trip and plenty for this coming summer in TN. Thank you – I still would to see a vlog lol. I know you are very busy. May your trip be blessed. She probably had some clothes but may not be able to do laundry in South Africa (I can’t remember if she said so in a previous post or comment). Also, she may have decided to buy lighter color clothes or different lengths than she would normally wear here in the U.S.
Good luck and have a good time Crystal. I can’t wait to hear more things about the living there and learning from the trip. I will be praying for you during your eventful week. I wonder how it will compare to your time in the DR.
I’ve been knitting for about 50 years and try to avoid seed stitch. I prefer patterns with uninterrupted stretches of garter stitch and/or purling. I find switching back and forth between the two constantly to be aggravating. I’m so glad to hear that the seed stitch is rather frustrating for very experienced knitters! That makes me feel encouraged. Be safe, have fun, and, from my four year old…don’t pick your nose or your friend’s nose. You are awesome so go for it girl! It has to be a boy thing. My oldest was like this too. Even if you don’t have access to WiFi, make sure you write about your experiences every day. Write it for yourself….don’t edit yourself thinking about what you would like to share publicly. It’s a great way to capture the memories and details you won’t otherwise remember. What you don’t realize is that the next day you will have another day rich in experiences. A week of those piled on top of each other and you won’t be able to absorb it all. You can edit and share when you get home. We take month-long international trips and I do blog about each day. I write every day and then when I can get an internet connection, all I have to do is download each. Sometimes it’s four or five days at once, but I haven’t forgotten what I otherwise would have and I’m not wasting Internet time writing. Yes! Such wise words of advice! Thank you for sharing! Good move not writing down your goals. We need downtime from all the intense focus of setting and meeting goals. It helps us remain balanced and get recharged for the next round of concentrated activity. Have a great trip! Looking forward to hearing all about it. Thank you for ministering to them and for sharing your experiences with us. Jesse LOVES DC, so he’s stoked to get to take the kids to some of his favorite sites and museums this coming week. And I’m so glad that they are going to have such fun adventures together while I’m gone! So excited for you! Be safe and have lots of fun! I can’t wait to hear all about it when you get back! What’s with all the baggies? Depends on season, weather, and activities of course, but surely the kids could wear things more than once, so no need for 10 pairs of pants. I’m a firm believe in minimalism when it comes to travel. Pack light! And you can always do laundry. Well, YOU may not be able to do laundry in Africa (although I’ve never had difficulty doing laundry in various places in Asia). But your family can certainly do laundry in DC. My rule of thumb for “plan on washing clothes mid-trip” vs. “take enough clothes for the whole trip” is about 6 days. Just like doing laundry at home — the more you let it pile up, the more of a chore it is to get it all done. For a 10-day trip, take clothes for 5-6 days and visit a laundromat half way though. One of the benefits of laundromats is that you can do multiple loads at once and get it all done in a fraction of the time it takes to do one load at a time at home. This way you can travel a lot lighter and it won’t take nearly as long to catch up on laundry once you get home. Yes, they will definitely be re-wearing some of their outfits. We’ve tried many, many different systems over the years and have found that having outfits all pre-organized in bags works so much better for us to keep things organized when packing and when on the road — especially on trips that are longer than a week. And we’re a big fan of doing laundry mid-trip whenever possible, too! When it comes to packing for trips, I find it most helpful to keep a list that can be referred to over and over. I have several lists because I pack differently depending on the purpose of the trip: family vacations, business trips, sport trips (my daughter is involved in a sport that requires 3-day travel several times a year, so there are things we need on these trips that we don’t need on others). I starting keeping these lists when my daughter was younger so that she could easily pack for herself, but I soon found it great for me too, and wishing I’d though of it years ago. So, what did you find out? Does South African Airways have WiFi on the U.S. to Johannesburg flights? I am taking my first trip to Africa in about 8 weeks and will be flying into Johannesburg as well. I am excited to hear all about your trip! We are guessing that it doesn’t have wi-fi, based upon what we can find out. I am so excited for you! I know it must be thrilling and a little terrifying, but to get to go to South Africa would be a dream. Just wanted to wish you a fun and safe trip. I can’t wait to see all the photos! Have a wonderful safe trip! So exciting! I will pray for you. Looking forward to hearing all about it when you get home! Hope you have a fantastic trip! !